We have fantastically good cycling weather now in southern Finland. And I’m happy to report the fact that I’m using this chance at full speed! 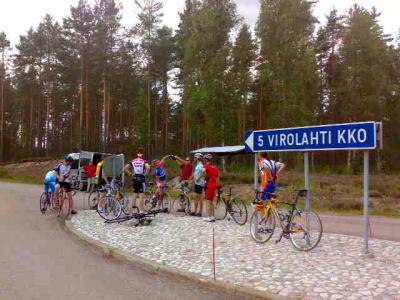 Specifically, last Saturday I participated in a group ride in Hamina region. The team looked terrific. Right, at least the core was composed of pro (or former pro) riders. Of course I could not keep up with 40 km/h speed… but nobody said I had to. I made the first lap at 34.4 km/h, hanging in the tail of the second group. I’m definitely not a competitive rider; in fact I have not ever participated in a road race. This was not a race neither, but it worked very well as a competition against self. It is probably thanks to other riders that I consumed almost 3 liters of water during less than 4 hours. Sportive! Not a keystone point, but definitely something to note: there was no participation fee. Thanks to the club which organized the ride and provided a service car (visible on the photo), which gave us water refill during stops. Sorry I do not even know what club it was.